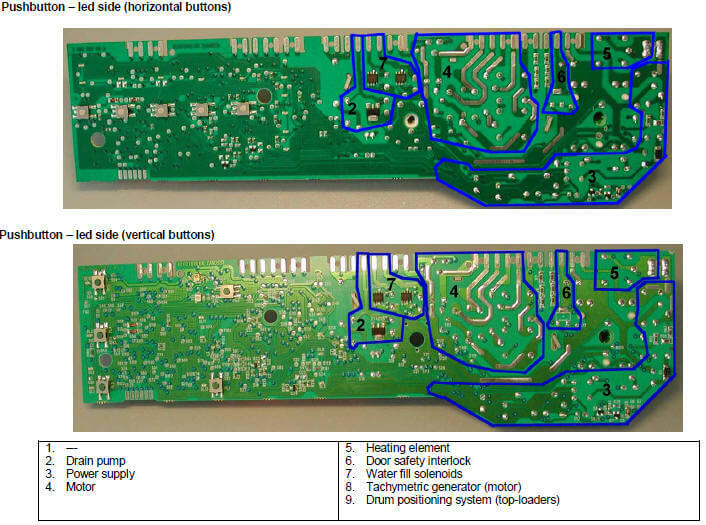 In case of burning on the main circuit board, check that the problem is not caused by another electrical component (short-circuits, poor insulation, water leakage). Refer to the figures below in order to identify the component that might have caused the burning according to the position of the burned area. The circuit board shown below is the version with the greatest number of components: other boards may not feature all these components (relay K4 and buzzer). E35 Water overflow Water fill solenoid faulty; Leaks from pressure switch hydraulic circuit; Pressure switch faulty; Wiring faulty; Circuit board faulty. Cycle blocked, door closed. Safety drain. Drain pump (sequence 5 min. ON – 5 min. Configuration alarms E93-E96: If these alarms are generated (when the appliance is switched on), operation of the appliance is blocked and all the LEDs light. The diagnostics procedure cannot be accessed; the only option is to switch the appliance OFF (by turning the selector to position “0”). Configuration alarm E94: For this alarm code, only the family for alarm “9” is displayed; the diagnostics procedure cannot be accessed, and the “rapid alarm display” function cannot be used. Alarms EB1-EB2-EB3: In the event of problems with the mains power supply, the appliance remains in alarm mode until the mains frequency or voltage are restored to the correct value or the appliance is switched off (by turning the programme selector to “0”). The family of alarm “B” is displayed; the diagnostics procedure cannot be accessed, and the “rapid alarm display” function cannot be used. The complete alarm code can be read only when the abnormal situation has ceased. Alarms E51- E52: During the diagnostics test, all the alarms are displayed. Normally, when the programme selector is turned from one test phase to another, the appliance exits the alarm condition and performs the phase selected. This does not take place in the case of alarms E51 (power triac on motor short-circuited) and E52 (no signal from the tachymetric generator on the motor): in these cases, the only option to exit the alarm condition is to switch the appliance OFF by turning the selector to position “0” (reset). 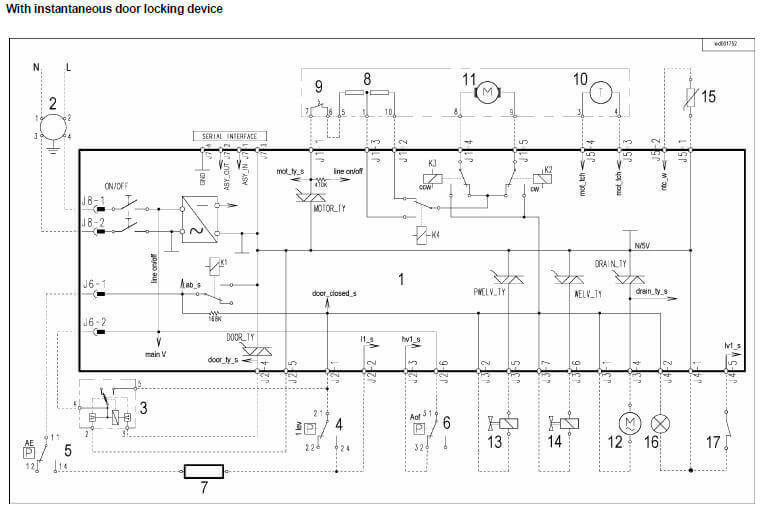 Privileg washing machine schematic diagram error codes fault service manual circuit diagram wiring schema repair instruction guide user manual free pdf download. Privileg Service Handbuch Schaltungen Reparaturanleitung Bedienungsanleitungen kostenlos pdf download. Privileg Schéma service manual schéma zapojení schémat oprava návod k obsluze návod k použití free pdf ke stažení. Privileg Schéma de principe de service manuel Schéma câblage schéma réparation instruction notice manuel téléchargement gratuit pdf. Privileg Diagrama esquemático serviço manual do circuito diagrama de fiação esquema reparação instrução guia manual do usuário livre PDF Download. Privileg Schema di servizio manuale circuito schema elettrico schema di riparazione di istruzioni guida manuale pdf gratuito scaricare. Privilegschemat instrukcja obsługi Schemat okablowania Schemat naprawa instrukcja instrukcja obsługi free pdf pobierz. Privilegşeması servis manuel devre şeması kablolama şeması onarım talimat kılavuzu kullanım kılavuzu ücretsiz pdf indir. PrivilegSchema service manual schema bedrading schema reparatie gebruiksaanwijzing handleiding gratis pdf te downloaden. Privileg schematică diagrame de service manualul de circuit diagrama de conexiuni Schema de reparatii de instructiuni Manual de utilizare pe gratis download pdf. 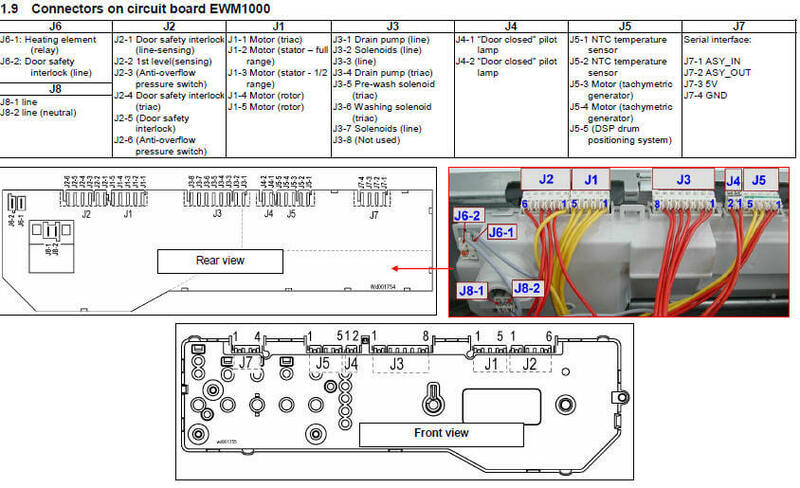 The purpose of this Service Manual is to provide Service Engineers, who already have the basic knowledge necessary to repair household washing machines, with information of a general nature regarding the HEC range of washing machines. Manuals (issued separately) for each specific model or functionality. Repairs to electrical appliances must be effected only by qualified personnel. Before accessing the components inside the appliance, always remove the plug from the power socket. Where possible, ohmic measurements should be effected rather than direct measurement of voltage and current. Certain metal components inside the appliance may have sharp edges. Care should be taken to avoid cuts or abrasions. Before laying the appliance on the floor, always drain any water by means of the system placed beside the drain filter. Never lay the appliance on its right side (i.e. electronic control unit side); this would cause the water in the detergent dispenser to fall onto electrical components, thus damaging them. After repairing the appliance, always perform the final tests. Before servicing receivers covered by this service manual and its supplements and addenda, read and follow the SAFETY PRECAUTIONS of this publication. Remember: Safety First. Use a transformer of adequate power rating as this protects the technician from accidents resulting in personal injury from electrical shocks. It will also protect the receiver and it’s components from being damaged by accidental shorts of the circuitry that may be inadvertently introduced during the service operation.